It only took a month. CNNMoney's Fear & Greed Index was at Extreme Fear early November just as US voters were thinking about who to elect as their next president. Today, it's back to Extreme Greed as the animal spirits run wild with Trump's proposals for trillion-dollar stimulus, tax cuts, and deregulation. What is the Fear & Greed Index? Investors are driven by two emotions: fear and greed. Too much fear can sink stocks well below where they should be. When investors get greedy, they can bid up stock prices way too far. From the standpoint of investment strategy, the Fear & Greed Index measures market sentiment and is seen as a contrarian signal. Market sentiment is also called "investor sentiment" and is not always based on fundamentals. It is important to day traders and technical analysts that use technical indicators to measure and profit from the short-term price changes often caused by investors' attitudes toward a security. Market sentiment is also important to contrarian investors that like to trade in the opposite direction of the prevailing sentiment. For example, if everyone is buying, a contrarian would sell. 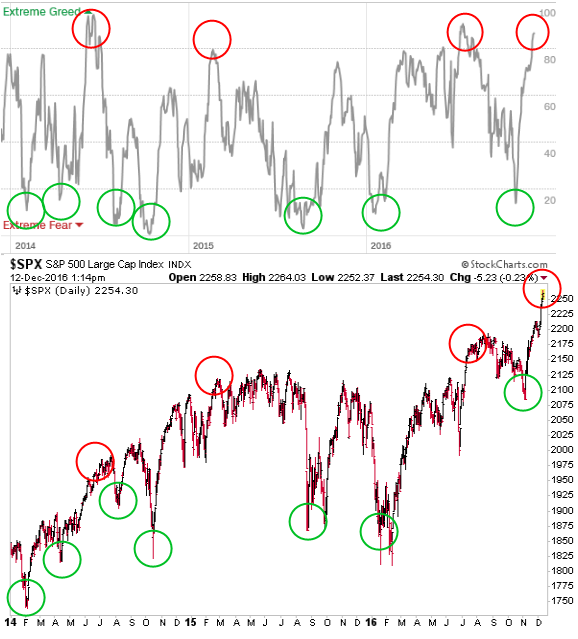 Sentiment is not a perfect timing tool but it does help indicate whether we are closer to a top or a bottom. When the Fear & Greed Index reached similar levels of Extreme Greed in the past, the S&P 500's gains typically slowed until the forces of greed were overtaken by the more powerful emotion of fear. As investors, we should probably expect at least the market to slow from current levels and at most for it to pullback or correct. That being said, going from Extreme Greed (selling opportunities) to Extreme Fear (buying opportunities) can sometimes take weeks or months, as the chart above indicates.